Robert Farrelly (born June 17, 1958) is an American film director, screenwriter and producer. He is one of the Farrelly brothers, alongside his brother Peter, and together are known directing and producing quirky, slightly offensive comedy films such as Dumb and Dumber, Shallow Hal, Me, Myself and Irene, There's Something About Mary, and the 2007 remake of The Heartbreak Kid. 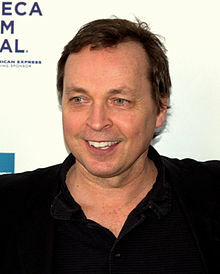 Farrelly was raised in Cumberland, Rhode Island, to Mariann, a nurse practitioner, and Dr. Robert Leo Farrelly. His grandparents were Irish immigrants. He is a graduate of Rensselaer Polytechnic Institute, where he entered the school on a hockey scholarship. In 2014, Bobby & his brother, Peter, directed Dumb and Dumber To, the sequel to their 1994 blockbuster hit Dumb and Dumber. In 2016, Bobby directed two episodes of Season 10 of the Canadian cult mockumentary TV series Trailer Park Boys. Farrelly has been married to his wife, Nancy, since 1990; they have two daughters and a son, who died in 2012. Farrelly’s youngest daughter is comedian AB Cassidy. Farrelly told the BBC that he is a Christian. ^ Tracey Leibach (September 2001). "Why is this man smiling?". RPI.edu. Retrieved June 19, 2013. ^ "Tragedy strikes Farrelly Family". 10 February 2012. ^ Russell, Jamie (24 September 2014). "Calling The Shots: Bobby Farrelly". BBC. Retrieved 23 March 2017. This page was last edited on 23 January 2019, at 15:11 (UTC).